A groom kisses a bride under the arch at the Castle Hill Wedding Venue. 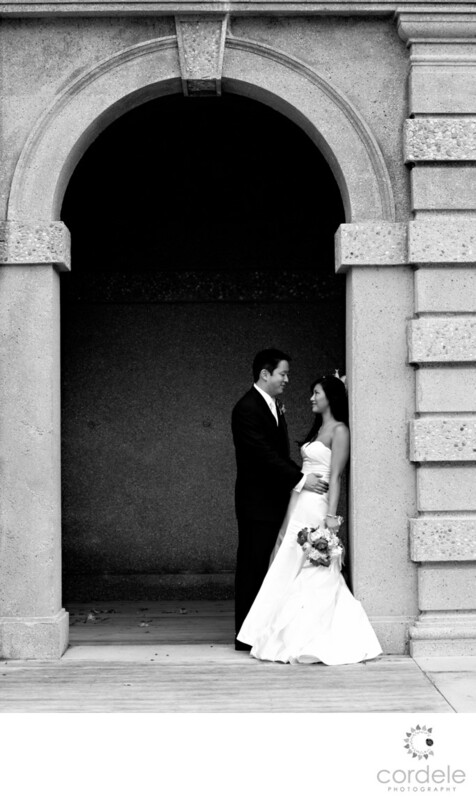 The arches at the Castle Hill wedding venue make for such an amazing backdrop. When I saw these Arches I knew I wanted the photos in black and white to bring people back in time. This is such a timeless photo of a couple enjoying a moment under the arch. It could be raining or it could be sunny. It doesn't matter they are together engaged and having time alone on their wedding day. This Black and white photo brings the image back to a simpler time which is one of the things about this older venue people love. I love how the brides totally let her flowers hand and the grooms holding her hip with his hand. it gives this wedding portrait of a the bride and groom romantic nostalgic feel.